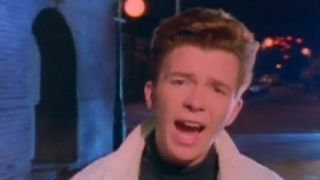 The internet went into a collective state of mourning this week when its most enduring meme, the RickRoll'D video, was removed from YouTube following a copyright claim. The original clip, viewed over 61 million times, was strangely pulled at the behest of security firm AVG. However, we're glad to hear Rick Astley's iconic Never Gonna Give You Up video has been reinstated. Rickrolling came into being in 2007, baiting web users to click on juicy hyperlinked text, traditionally promising super-exciting news (i.e. Chris Nolan to direct three more Batman movies). Naturally, the link really directs you to Rick's iconic promo video for the 80s classic and hilarity ensues. Again and again, and again. Rickrolling, which has become the internet equivalent of tapping someone on the shoulder and looking the other way, began life on the infamous 4Chan website. In its five years on the earth, it has outlived thousands of other memes and ensured a brief comeback and pay-day for its baby-faced, jiving pop star. The company behind the copyright claim, AVG Technologies, makes anti-virus software so it's difficult to join the dots as to why it was pulled in the first place. Thankfully, YouTube saw sense and restored one of the most viewed clips ever on the site. We can rest easy tonight knowing that Rick's promise to 'never make us cry or say goodbye' remains unbroken. Perhaps the good people of the internet should form an alliance to protect our memes from devastating atrocities like this ever occurring again. Meanwhile, have you seen our exclusive news from inside the Apple plant on the brand new Apple iTV television?